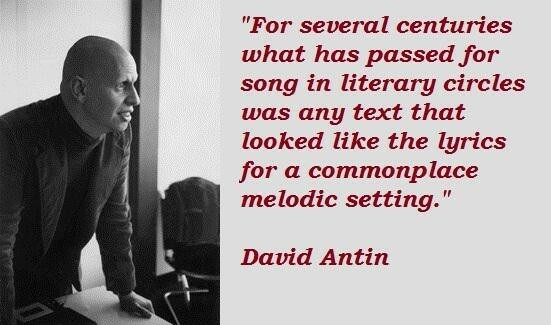 See the gallery for quotes by David Antin. You can to use those 8 images of quotes as a desktop wallpapers. There are editing procedures for talks just as there are editing procedures in jazz improvisation. There is probably no oral society that fails to mark the spatial distinction of left and right, peculiar as this distinction may be. You pay your money, you take your choice. I get the audience my language attracts and I lose the ones it repels. I had no idea where these kids at a small private college in the San Fernando Valley were coming from, why they were coming to hear me, or what they needed to know. 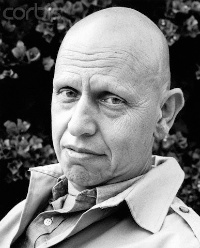 I was very committed to the process of composing, working at poems, putting things together and taking them apart like some kind of experimental filmmaker. I'm aware of my audience in a way, and I do try to engage with them while I'm trying to go about my business of thinking. I believe they help me by providing a focus. When I got to the reading all the work, I was reduced to being an actor in an experimental play that I'd already written. And I didn't want to be an actor. While I don't script and I don't use other performers, I think my taste for underlying precision gives me something in common with Allan and George Brecht. While I've had a great distaste for what's usually called song in modern poetry or for what's usually called music, I really don't think of speech as so far from song. Children frequently sing meaningful phrases to themselves over and over again before they learn to make a distinction between singing and saying. When you grow up in a family of languages, you develop a kind of casual fluency, so that languages, though differently colored, all seem transparent to experience. Disney made a fortune out of inventing the businessman's idea of the imaginary as the contradictory of the businessman's idea of the real. For several centuries what has passed for song in literary circles was any text that looked like the lyrics for a commonplace melodic setting. 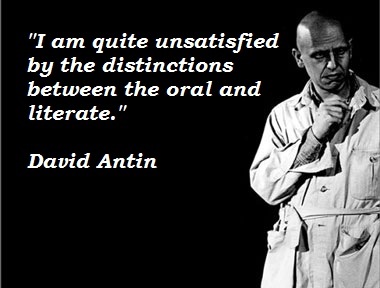 I am quite unsatisfied by the distinctions between the oral and literate. I didn't think about whether I was writing poems. I was thinking. And the more I was thinking, the more there was I didn't understand. I hardly remember how I started to write poetry. It's hard to imagine what I thought poetry could do. I learned enough Hebrew to stagger through a meaningless ceremony that I scarcely remember. 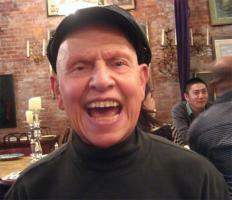 I tended to emphasize the secular, the casual, the colloquial, the vernacular against the sacred. 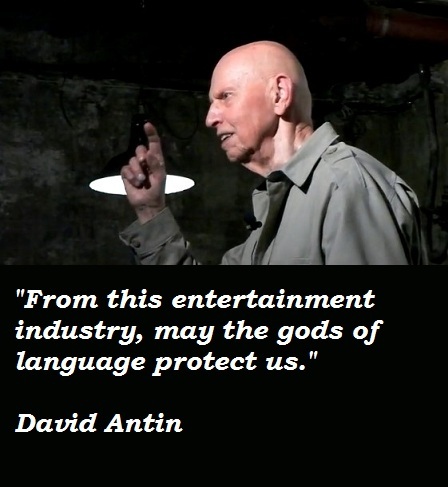 Much more quotes by David Antin below the page. I wanted to be an inventor, whatever I thought that meant then. I guess I was thinking of Edison or maybe James Watt. Or maybe even Newton. I was trying to find out what it was that everybody else understood without giving up my stubborn and hard-won lack of understanding. I'm not sure what theory is, unless it's the pursuit of fundamental questions. I'm standing up thinking. Anybody who wants to listen is welcome. If not, I'm happy to see them go. 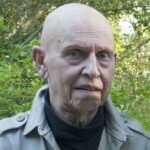 It's hard being a hostage in somebody else's mouth - or a character in somebody else's novel. My mother turned into a professional widow. 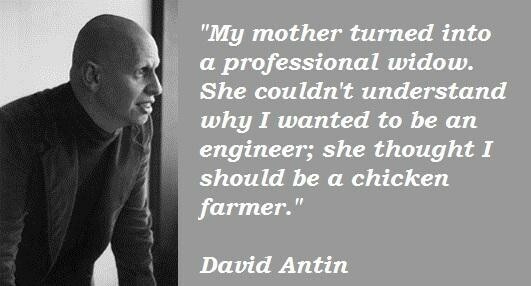 She couldn't understand why I wanted to be an engineer; she thought I should be a chicken farmer. My rejection of the idea of entertainment in its current form is based on the audience that comes with it. Stories are different every time you tell them - they allow so many possible narratives.